A combination of style and utility, these Laptop Backpacks meet all the demands of the modern-day executive. Designed for maximum comfort, these backpacks carry all the important accessories such as laptop, battery charger, cell phone, business cards, pens, PDA, etc. Padded back that protects objects inside the pack from sharp edges and increases comfort. 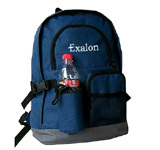 Personalize these Laptop Bags with your Company Name or Logo embroidered on it. Use these Laptop Backpacks as Promotional Corporate Gifts for your clients, employees, business associates etc.